Who said discipline is only restricted to your lifestyle? 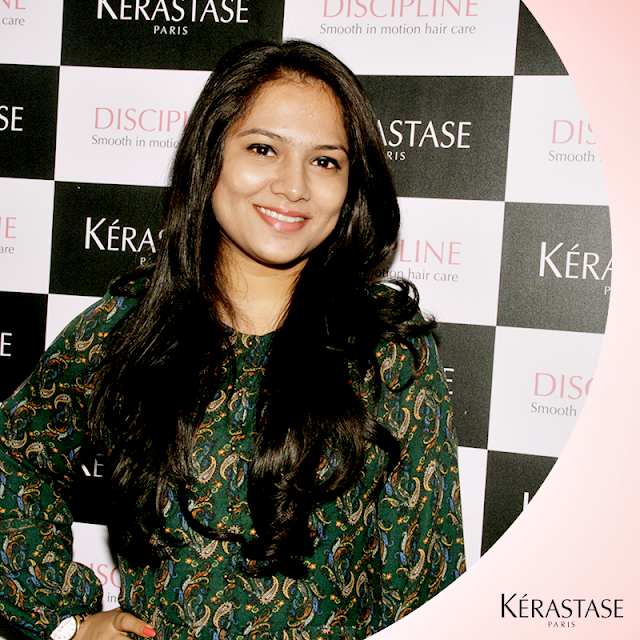 Well, what if I say that discipline, when blended with the right set of products, can result in smooth and gorgeous hair? Yes, you read that right. A woman's romance with her hair never ends. Haircuts, color and the best of hair rituals; she will do everything to keep it beautiful. After all, you are never fully dressed without the perfect hairstyle. And to keep that romance going, one of our favorite hair care brands, Kerastase, has recently introduced a ritual named Discipline, that promises to get rid of frizz, while providing care and discipline to your hair. After a detailed introduction and understanding of the Discipline range, the in-house expert analysed my scalp and hair, in order to understand its condition. She recommended a few products that will suit my hair type and showed me the pictures (captured using their state-of-the-art hair analysis machine) that were proof of all the damage that winter and my crazy schedule has done to my hair. She further explained the entire process of the Discipline ritual. The first hair wash began and the first product from the Discipline range was introduced. The Kerastase Bain Fluidealiste Sulfate Free shampoo was used, which gently cleansed my hair, leaving a strong fragrance that I loved. Just a little amount was enough and post emulsification, it was massaged on my scalp for a few minutes and then, washed off. No conditioner was used after the shampoo. Be prepared to let your hair feel light as a feather as the expert then moves on to massaging your hair with the Kerastase Maskeratine. After towel drying your hair and leaving it damp, the product (packed with Morpho-Kertaine) is gently massaged on your hair for 5-6 minutes. This was definitely my favorite part, as for a few minutes, the lights were dimmed and the gentle strokes of the massage made me forget how packed rest of the day actually was. I closed my eyes and went into an almost meditative mode. After the massage, my tresses were sectioned and a hair iron was used, in order to ensure that the properties of the product were locked in. After the massage, my hair was thoroughly washed and towel dried. It was then time to move on to the last and most important step - styling. Post wash, my hair was towel dried and the super smooth (yet non-greasy) Kerastase Fluidissime anti-frizz leave-in care was sprayed on each section with great case. The leave-in promises to add a glossy finish to the hair, while protecting it from heat and facilitating faster, long-lasting blow dries. After spraying the product and ensuring each section is well protected, my hair was blow dried. If there was one word to describe this ritual, it would be luxurious. The Kerastase Discipline ritual is all you need to pamper your hair in the best possible way. The 5 step treatment added some excellent volume and shine to my hair, that lasted a good fortnight. It left my hair feeling a lot lighter. True to its tagline, this really is a smooth in motion hair care, that gets rid of rigidity and leaves your hair super soft and fluid. For those who suffer from unmanageable hair and extreme frizz, I would definitely recommend this miracle ritual, that will do wonders to your hair. Plus, the fragrance of these products are fantastic. So much, that it continues to linger even after days. Kerastase rituals spell luxury and they are always priced at the higher end. While the Discipline Express Ritual is priced at Rs 2000 (30 minutes), the Discipline VIP ritual is available for Rs 3200 (90 minutes). But trust me, this ritual is worth every penny. Your tresses are your baby. If you don't invest in your hair, who will? My honest and heartfelt opinion - A must try! PS: The Discipline range is also available as a three step hair management home care regime. It consists of - The Bain Fluididealiste Sulfate free (Rs 2000 for 250ml), Maskeratine smooth-in motion masque (Rs 2750 for 200ml) and Fluidissime (Rs 2000 for 150ml). The products are available at all Kerastase affiliated salons. For more information, like the Kerastase Facebook Page. Absolutely, Rameshwari! You must try it too. How long does this ritual last on the hair? It depends on your hair type. While the results are good enough to last for a week - fortnight, it maybe lesser if you have an oily scalp. Also, the results (shine and smoothness) do last even after 2 washes. Does the home range give similar effects ? I really am not sure about how this works with color treated hair. My thought would be that it wouldn't hurt because it's not using any chemicals or anything that would strip the hair of the coloring, but I may be completely wrong on that. For more info look at here.